Includes the words and phrases most commonly used by health professionals to eliminate the time-consuming process of looking up words in the dictionary. Specific questions that elicit yes or no answers assist health care providers with quickly obtaining essential information from patients. Sample dialogs cover common situations in the health care setting. 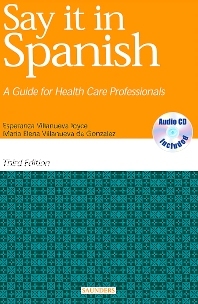 Basic vocabulary such as numbers, colors, days of the weeks, and members of the family is included to facilitate conversations with Spanish-speaking patients. Vocabulary tables highlight basic vocabulary within the text for quick reference. Phrase and Sentence Index includes an alphabetical listing of all phrases and sentences used in chapter dialogs. An alphabetical Word Index allows easy access to specific words. Information on Hispanic culture and popular health beliefs helps readers provide culturally appropriate care. Pronunciations are provided for all sample dialogs and vocabulary so readers can speak with confidence.